Chris is at the top of the list when it comes to standout guides in Colorado. He has been in the fishing industry since he was 10-years-old. “I ran a bait shop out of my family’s barn in western New York when I was growing up. I sold night-crawlers, minnows, and crayfish to local bass fishermen.” This is when Chris learned that the fishing industry is not all fun and games. “I remember crawling around the lawn at 3 am trying to find enough worms to supply the next morning’s rush of fishermen.” Chris now uses flies instead of worms, but his work ethic has not changed a bit. “I pride myself in making sure that my clients will have a great day on the river, whatever it takes”. 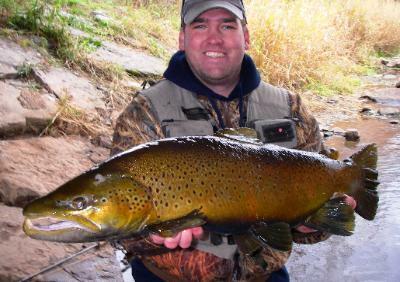 Chris can usually be found on one of the many trout streams in Colorado. He specializes in the many private ranches of the North Fork of the South Platte River just outside of Denver. In the fall Chris makes an annual trip back to his home waters of western New York State to chase after the monster salmon, steelhead, and brown trout in the Lake Ontario tributaries. Chris uses Equiptment from the Following Manufacturers.